People are often aware of the important steps to take after a car accident, such as calling 911, going to the hospital, and reporting the accident to a car insurance provider. But what victims may not know is that evidence to support their injury claims may be cleared away from the accident scene in the minutes and hours following a crash. Since most people are stressed and confused immediately after an accident, it is important to contact an attorney right away so crucial evidence may be gathered before it is too late. When it comes to providing evidence in an insurance claim or injury lawsuit, it is always better to have too much than too little. The burden of proof after a car accident case always rests on the person seeking damages—and the more proof you have of the other driver’s fault, the extent of your injuries, and vehicle damage, the more likely you are to obtain a settlement to cover your costs. Accident reports. Police and ambulances responding to the 911 call will have to document their actions at the scene. Emergency responders will create medical reports of your injuries and the care and interventions they perform, while law enforcement officers will create an official accident report that may include a determination of which driver is legally at fault. Information from the other driver. If you are able to speak with the other driver, you should get much more than his name, address, and driver's license number. Be sure to record the driver’s vehicle plate number, insurance information, and whether or not the driver was on a work-related journey (since the employer could be held liable for damages). Also record any impressions you have of the driver, such as whether he is agitated, seems intoxicated, or admits fault for the crash. Pictures. 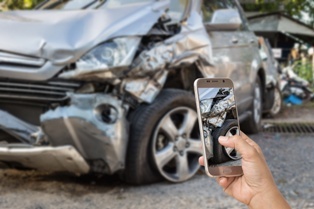 Cell phones can be invaluable after an accident, as they allow people to take pictures and video seconds after an accident occurs. Snap a few photos of the condition of both vehicles, the position of the vehicles, and the location of traffic signs and signals. Be sure to take a photo that shows the scene as a whole, including the road surface (if there are any potholes or skid marks) and other damaged objects (such as trees or utility poles). If you have time, try to get photos from as many angles as possible. Finally, you may want to take close-up pictures that show the detail of the damage, as well as detailed photos of any injuries sustained by you or your passengers. Witness statements or testimony. If there were people nearby who saw the accident, write down the names and contact information of each one. If any witnesses took pictures of the accident, ask him to send you a copy. Even if you are only able to gather a few pieces of evidence at the scene, it may be enough to help your attorney create a clear picture of the incident. If you are having trouble recovering after a car accident, our injury attorneys have offices in Illinois and Missouri to advise you on your next steps and legal rights. Contact the Tapella & Eberspacher Law Firm via our online contact form to schedule an appointment. We also invite you to download your FREE copy of one of our books, When the Rules of the Road Get Broken: A Guide to Illinois Car Wreck Cases or The Missouri Car Crash Guide: Don't Wreck Your Car Crash Case!